How’s everyone enjoying the FALL FRENZY? We’ve got another bonus for All Access members this weekend! 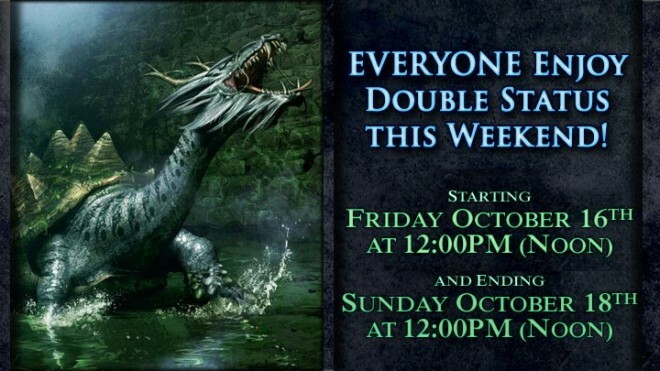 From 12:00PM (Noon) PDT on Friday, October 16 through 12:00PM (Noon) PDT on Sunday, October 18, All Access Members can get DOUBLE STATUS. The bonus will be available on all servers (including TLEs). Hop into game and enjoy the bonus! Remember, Fall Frenzy is leading up to Terrors of Thalumbra. Have you pre-ordered your copy yet? NOTE: This is, in effect, Double Guild XP.